How the web will look on the Flash-less iPad, according to Adobe. Why is there no Adobe Flash on the iPad? Adobe says it’s not because it’s buggy, as an Apple source claimed this afternoon to CultofMac.com. It’s because Apple is protecting revenue streams derived from content like movies and games. If users could watch free TV shows on Hulu, they wouldn’t buy them through iTunes. “It’s pretty clear if you connect the dots: the issue is about revenue,” says Adrian Ludwig, an Adobe group product manager for Flash, during a telephone interview on Friday afternoon. 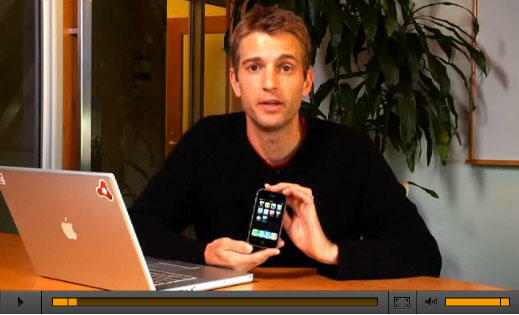 Adobe's Adrian Ludwig demonstrating Flash apps on the iPhone. Picture by Flashstreamworks. While Steve Jobs says the iPad offers the best web-browsing experience, Flash isn’t part of it. Adobe’s plug-in is nowhere to be found, making popular sites such as YouTube and Hulu useless on Apple’s new device. Likewise, Flash is also absent from the iPhone and iPod touch. Ludwig flatly denies that Flash is excluded from Apple’s mobile devices because it is buggy, crash-prone or puts an excessive strain on batteries. Ludwig says there is no technical reason that Flash should not be on the iPad as well as the iPhone. Adobe is working with about 50 partners in the mobile space, including big names like Google, Nokia and HTC, as well as 19 out of 20 handset manufacturers. (See Adobe’s Open Screen Project website). Ludwig said the Flash player is stable and would perform well on hardware like the iPad. But Ludwig notes that if Flash were available on the iPad, users could watch TV shows on Hulu for free instead of buying them through iTunes. Likewise, users could play some of the hundreds of Flash games on sites like Miniclip, instead of buying games through the App Store, on which Apple takes a 30% cut of every sale. Ludwig notes that other companies’ technologies that could be used to serve content or games are also excluded — Java, Ruby, Python and .Net. Ludwig says Adobe has been working closely with Apple on Flash for the iPhone (he didn’t say if or when it would ship), but wasn’t aware Apple had tested it on the iPad.